Whether you’re trying to keep track of a zillion tabs, navigate your bookmarks, or deal with a page that just won’t load, the more you use your Web browser, the more likely you are to run into problems. But with the help of hidden features and third-party add-ons, you can tackle these troubles and squeeze even more efficiency out of Apple’s Safari 3 ( ) and Mozilla’s Firefox 2 ( ) and 3. Safari’s and Firefox’s tabbed browsing features let you open multiple sites within a single window, thereby reducing screen clutter. But some aspects of tabbed browsing are less obvious. Although Safari doesn’t have an auto-restore feature, you can manually regain sites by selecting History: Reopen All Windows From Last Session. To restore sessions automatically, try Hetima Computer’s free SafariStand 3. Once you’ve installed it, choose Stand: SafariStand Setting. Under General, from the Restore Method At Launch pop-up menu, select Automatically Reopen Last Session (Safari). Note that the software uses an unofficial method to alter Safari’s behavior. It could stop working after an update to Safari or OS X. How many times have you read something on the Web and later had no idea where to find that information again? Although browsers keep track of your history—a list of URLs you’ve visited recently—that isn’t much help if you don’t know the name of the site or if the page is no longer in the history list. There are several ways to solve this problem. Use a Search Tool If you’re running Mac OS X 10.5 (Leopard), you can easily search the contents of pages you’ve visited. That’s because Spotlight indexes everything you look at in Safari, except when you’ve enabled private browsing (Safari: Private Browsing). Click on the Spotlight icon in the menu bar and enter your search term, and Spotlight will display a list of matches under Webpages. But there’s a catch: even though Spotlight knows the text that was on the page, it can’t display that text if the page no longer exists. For that, you’ll need a more powerful tool, such as St. Clair Software’s $20 HistoryHound 1.9.2. If you haven’t upgraded to Leopard, or you don’t use Safari, check out Google’s free Google Desktop ( ). Like Spotlight, Google Desktop indexes the contents of pages you visit; also like Spotlight, it doesn’t store pages, so you must go back to the original site once you’ve discovered a match. But unlike Spotlight, Google Desktop supports numerous browsers (including Firefox), and can even index messages from your Gmail account, not to mention other files on your hard disk. Clip Your Content Although you can’t beat the convenience of programs that automatically save and index your Web pages, they can quickly overwhelm you with irrelevant information. For better control, consider a program like Bare Bones Software’s $39 Yojimbo 1.5 ( ) or Devon Technologies’ $40 DevonThink 2. Both let you manually clip and store Web pages—or portions of pages—in searchable databases. An even more promising option is Evernote Corporation’s free Evernote, a service that lets you clip information such as Web pages, text snippets, and images, and access it through software on your Mac, a Web browser, or a mobile device such as an iPhone. The service indexes all of the text in your clippings (even text that appears in photographs), so you can easily search for content from any device. If you have multiple bookmark lists strewn across different browsers—or even across several machines—it’s time to rein in the chaos. With the utility Bookdog, you can consolidate bookmarks from all of your browsers. Sync Your Bookmarks If you use several browsers, each with its own set of bookmarks, try merging them with Sheep Systems’ $20 Bookdog 5.1. The software can display, edit, verify, and sort bookmarks from multiple browsers, as well as copy or merge bookmarks between two different browsers. It can also sync with Google Bookmarks, so you can use those bookmarks online. Make Bookmarks Universal If you prefer to access bookmarks from one place, consider a bookmark manager. Alco Blom’s $25 URL Manager Pro 3.5 ( ); stores bookmarks in its own database, providing a systemwide menu that allows you to select them from most browsers. Agile Web Solutions’ free AllBookmarks 3 displays a menu-bar item containing all of your bookmarks from Safari and Firefox, as well as from the free Flock 1.0.3 browser ( ), the Camino Project’s free Camino 1.5.5 ( ), and the Omni Group’s $15 OmniWeb 5.6 ( ). Selecting a bookmark opens that page in your default Web browser. Sync Online If you use Safari, you can use Apple’s new MobileMe service to sync Safari bookmarks between multiple Macs, just as in the past, you were able to use .Mac. 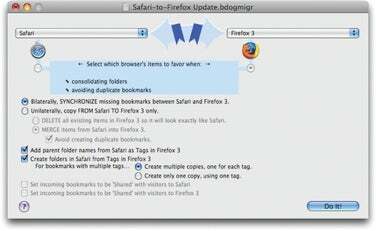 Firefox users can download the Foxmarks Bookmark Synchronizer add-on, which provides online syncing capabilities—even across platforms.